This month I hope to inspire you to plan a craft for Lughnasadh. It’s still a month away, which gives you plenty of time to decide what you want to do and to collect up supplies. Lughnasadh (also known as Lammas) is the first of the three harvest festivals. 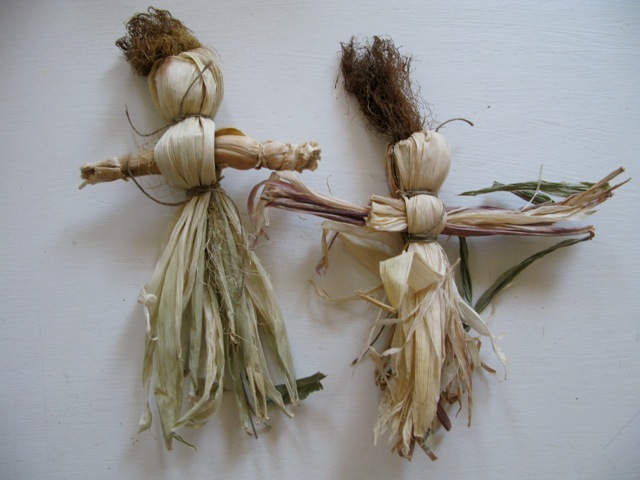 Where I live in central Connecticut, corn is in season, making cornhusk dolls an easy choice. There are many directions available online, some of which I tried to follow before getting confident enough to just wing it. So think about following along for a bit, then just doing your own thing. I can generally make one doll from one ear of corn. I start with fresh husks that are smaller and closest to the ear of corn, a good piece of the “hair” and some fine cord. Taking a chunk of the hair, I lay it on the wide end of a husk, the dark brown end facing away from the end. I add overlapping layers of husks around the hair. You might try for at least eight or more. I’ve never counted, so I don’t know. Next, holding the end, I carefully turn back each of the husks. Some will split, but that’s okay. When they’re all turned back, fold them down around the end and tie them off with another piece of cording. Now you will have a head with hair coming out the top. If there was a enough of it, you can fan it, or you can just leave it a cascading ponytail. I make arms by taking the longest one or two pieces of the outer husks and split them the long way into two or three pieces. Placing them on top of one another, I alternate which way the wide end faces. Determining the mid point, each end gets folded back just a bit past that mark. Now, divide the corn husks beneath the head roughly in half. Tuck the folded arms up under the head and bring all the husks back together, making another tie below the arms. There are many variations. For one of my dolls, I used a particularly long stem broken off the ear of corn for the arms. To make a corn man, divide the “skirt” into two legs and tie off at the knees and ankles. Some people make the dolls from other dried grains. As a substitute for corn, I would use whatever grasses or grains I could find growing wild. Depending on my ritual, my dolls have been placed on the altar as decorations, used to represent the Corn Mother and then burned the next time the wheel turned again to Lughnasadh, or they have been made to represent myself and what I was thankful for at the first harvest and then offered to the fire. There are things to harvest the beginning of August besides corn. For that reason, you may want to gather up plants and herbs to make your own smudge sticks. Choose a sunny, dry day. Using scissors or clippers, cut plants to an equal length, such as five inches. You can use plants such as white sage (not garden sage), mugwort, rosemary, pennyroyal, lavender, sweetgrass, cedar, thyme, balsam, hemlock pine, juniper, mint or lemon balm – or a combination of a few. Know that some herbs, even culinary herbs, give off a toxic odor when burned. Be sure to research and test a small amount of dried substance outdoors before including it in your bundle. Group several branches with the cut ends together. Take a piece of thin, cotton string (or separate out three strands of cotton embroidery floss) two and a half times as long as the plant material and, leaving a couple of inches hanging free, tightly wrap it around the stems close to the end. Continue wrapping down the bundle, then back up, so that the sting creates a criss-cross pattern. Use as little string as possible – just enough to hold it together. Wrap tightly because the bundle will shrink as it dries, but no so tightly that the string cuts into the leaves. Tie off the ends. You can hang to dry, or place them in a dark place where there is good air circulation. Putting them on a screen or grate above a solid surface, allows air to circulate. They can be burned when they are dried completely; this can take three weeks or more. The thicker you make it, the longer it takes to dry, but the slower it will burn. To use, hold the end and light, being careful for any flyaway pieces. Allow the stick to burn a few seconds, then blow out the flame and allow it to smolder. To put it out, crush the smoldering end or rub it into sand. I hope you’ll post a picture of what you were inspired to make.